Garden pruning shears work best for:fruit and veggie vines such as tomatos, cucumbers, eggplants,zucchini and squash. 1,The ideal trim method is in leaves above the sprout approximately 6mm place, according to 45 setting angle trim.After the trim, when sprout long new thingses, plant's overall shape easy to control,is more artistic. 2,When trim remain has been long,then sprout above branch necrosis,and easy to initate plant disease. 3,When trim is too near to the sprout,then the sprout does not come out on association president. 4,When trim prunes the surface too to incline, will then injure the plant. 1,The forehead bit is sharp,if operates or the use does not work as,will cause the damage to the body. 2,When use or depositing,body's each spot should maintain a safe distance with the bit. 3,Must place the pruning shears the place which the child cannot attain. HIGH QUALITY WITH SK-5 BLADES:This garden Pruning Shears with high carbon steel SK-5 blade(a extra same quality SK-5 blade offered), more sharp and durable for cutting branches compared with other shears;Aluminum+PVC material handle is very pretty for grip. ERGONOMIC DESIGN:The rubber cushion on handle is designed for a firm and comfortable grip;One-hand security lock can prevent it from dropping accidentally and then hurting somebody. 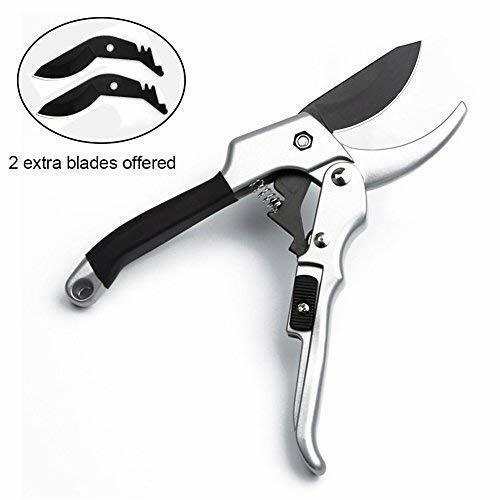 WELL-USED PRUNING SHEARS:Coated with the Teflon non-stick layer, well preventing the dust sticking on;The industrial pulley help -30% off effort when cutting.However,it's pefect for cutting the branches within 0.8in in diameter. FLORIST GRADE TOOL:Pruning shears let you cut a pretty floral bouquet and great for cutting stems, light branches of trees, rose bush, shrubs and hedges. WHAT YOU GET:We offer a 1 year 100% satisfaction guarantee & easy-to-get customer service.We'll always be here if you need. If you have any questions about this product by Ucharge, contact us by completing and submitting the form below. If you are looking for a specif part number, please include it with your message.